The evidence-based design elements are quickly becoming mainstream in the design of US hospitals. Clearly, they are as applicable and relevant to hospitals the world over. Hospitals are extremely stressful places for patients, their families and the staff who work there. Patients are not only faced with the prospect of dealing with their illness and injury but are forced to reckon with an environment that further exacerbates their pain and stress. Hospitals that are noisy, have complicated layouts and confusing wayfinding systems, poor ventilation and air quality and few positive distractions are common the world over. Such environments contribute to nosocomial infections, medical errors and other outcomes including lack of sleep and increased anxiety. At the least, this can slow down the healing process and at work, may even result in death and serious injury. There is increasing awareness that the physical environment is a critical component of the care provided in hospitals and plays an important role in promoting patient and staff safety and health as well as overall quality of care. A large body of research exists that attests to this. A study conducted by researchers at The Georgia Institute of Technology and Texas A&M University in 2004 identified more than 600 articles, most published in scientific peer-reviewed journals linking the physical environment of healthcare facilities with patient and staff health, financial and operational outcomes (Ulrich, et al., 2004). Just as medicine has increasingly moved toward “evidence-based medicine,” where clinical choices are informed by research, healthcare design is increasingly guided by rigorous research linking the physical environment of hospitals to patients and staff outcomes and is moving towards “evidence-based design”. Evidence-based design refers to the process of using the best available evidence from research and project evaluations to create healthcare environments that are therapeutic, supportive of family involvement, efficient for staff performance, and restorative for workers under stress. Many new hospitals in the United States are being designed based on evidence based design principles. Further, healthcare clients are now demanding that architects be able to demonstrate their knowledge of evidence-based design process. Hospitals that carefully consider how physical environmental design likely impacts patient, staff and organisational outcomes will go a long way toward supporting the efforts of healthcare administrators and clinicians as they deal with issues of patient safety and quality in their hospitals. The Center for Health Design, a nonprofit research and advocacy organisation has pioneered a joint research effort with healthcare providers called the Pebble Project. These healthcare organisations are at different stages in the design and construction of new replacement projects, renovations or hospital additions. By becoming a Pebble Project Partner, these organisations commit to utilising the best available information to make informed decisions during this critical phase of their development and to measure the outcomes of the decisions they make once the project is complete and to share the results of these efforts with the design and healthcare community. Pebble Partners such as Bronson Methodist Hospital in Kalamazoo, Michigan, Clarian Methodist Hospital, Indianapolis, Indiana and St. Joseph’s Hospital, West Bend, Wisconsin have been very successful in incorporating evidence based design principles in their processes. These hospitals as well as others have received nationwide and international recognition for their work. Also, these organisations have documented many positive outcomes including increased patient and staff satisfaction, reduced staff turnover and many other organisational efficiencies*. Some of the evidence-based design elements that are being incorporated by the Pebble Project Partners and other hospitals in the United States, Europe and Asia and the measured benefits of these designs for the patients and staff as well as the healthcare providers are discussed here. Based on a large body of research evidence as well as emerging information from Pebble Partners and others, most healthcare providers in the United States are moving towards providing all single bedrooms in their facilities. Some of the documented benefits of single bedrooms over double bedrooms or open bays include lower nosocomial infection rates, fewer patient transfers and associated medical errors, far less noise, much better patient privacy and confidentiality, better communication from staff to patients and from patients to staff, superior accommodation of family and consistently higher satisfaction with overall quality of care. This evidence is also reflected in the 2006 version of the AIA Guidelines for Design and Construction of Health care Facilities which recommends single bedrooms in all new hospitals under construction in the United States. Patients are transferred from one room to another as often as 3 to 6 times during their short stay in the hospital in order to receive the care that matches their level of acuity. This process results in increased costs, reduced quality of care, reduced satisfaction, medical errors, wastage of staff time and reduced staff productivity. The acuity adaptable model potentially addresses this problem by providing different levels of care in a single room so as to minimise the need to transfer patients as patients’ acuity level changes. Acuity adaptable patient rooms are single patient rooms with acuity adaptable headwalls—which are equipped with the gases and equipment needed to provide care as patient acuity changed. The impact of a 56-bed acuity adaptable unit (28 rooms on two floors) at the Clarian Methodist Hospital in Indianapolis on different outcomes was measured by comparing two years of baseline data (before the move) and three years of data after the move. The researchers (Hendrich et al., 2004) found significant improvement post-move in many key areas: patient transfers decreased by 90%, medication errors by 70% and there was also a drastic reduction in the number of falls. There is strong evidence that light is critical to human functioning and can be extremely beneficial to patients as well as staff in healthcare settings. Adequate lighting conditions are essential for performance of visual tasks by staff in hospitals, and poor lighting conditions can result in errors. There is also strong evidence that shows that exposure to light helps in reducing depression, alleviating pain, and improving sleep and circadian rhythms among patients and, thus, supports the healing process. Studies conducted among different populations show a strong preference for daylight over electric light. 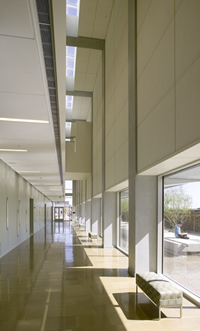 Building interiors are lit by a combination of daylight and electric lighting. Daylight entering through windows can be extremely beneficial to patients, provided there is no glare and it is possible to control light levels. However, in addition to natural light, electric light is needed in all parts of the hospital, though the need for artificial lighting can be reduced by efficient utilisation of sunlight wherever possible. Windows that let in natural light have the additional benefit of providing views to the outside that orient patients and staff to the time of day as well as provide positive distraction. Ulrich (1984) found that patients recovering from abdominal surgery recovered faster, had better emotional well-being, and required fewer strong pain medications if they had bedside windows with a nature view (looking out onto trees) than if their windows looked out onto a brick wall. The importance of good air quality in controlling and preventing airborne infections in healthcare facilities cannot be overemphasised. Providing clean, filtered air and effectively controlling indoor air pollution through ventilation are two key aspects of maintaining good air quality. Several studies show that high-efficiency particulate air (HEPA) filters, in particular, are highly effective in filtering out harmful pathogens and are strongly recommended in areas housing immunocompromised patients. Adequate ventilation rates and regular cleaning and maintenance of the ventilation system are critical for controlling the level of pathogens in the air. Some special precautions to prevent infection during periods of construction and renovation include using portable HEPA filters and installing barriers between patient care and construction areas. Hospitals are extremely noisy, and noise levels in most hospitals far exceed recommended guidelines. The high ambient noise levels, as well as peak noise levels in hospitals, have serious impact on patient and staff outcomes ranging from sleep loss and elevated blood pressure among patients to emotional exhaustion and burnout among staff. Poorly designed acoustical environments can pose a serious threat to patient confidentiality if private conversations between patients and staff or between staff members can be overheard by unintended listeners. At the same time, a poor acoustical environment impedes effective communication between patients and staff and between staff members by rendering speech and auditory signals less intelligible or detectable. Installing high-performance sound-absorbing acoustical ceiling tiles results in shorter reverberation times, reduced sound propagation, and improved speech intelligibility. Also, this design measure increases speech privacy as less sound travels into adjoining spaces. In addition, providing single bedrooms and removing noise sources from the unit helps to reduce noise levels at the patient’s bedside. Patient lifting is a major cause of injury to healthcare workers. According to Fragala and Bailey (2003), 44% of injuries to nursing staff in hospitals that result in lost workdays are strains and sprains (mostly of the back), and 10.5% of back injuries in the United States are associated with moving and assisting patients. Reducing injuries that result from patient-lifting tasks can not only result in significant economic benefit (reduced cost of claims, staff lost workdays), but also in reducing pain and suffering among workers. Ergonomic programs, staff education, a no-manual lift policy, and use of mechanical lifts have been successful in reducing back injuries that result from patient-handling tasks. When PeaceHealth in Oregon, a Pebble Partner, installed ceiling lifts in most patient rooms in their intensive care unit and neurology unit, they found that the number of staff injuries related to patient handling came down from 10 in the two years preceeding lift installation to 2 in the three years after lift installation (Joseph & Fritz, 2006). The annual cost of patient handling injuries in these units was reduced by 83% after the lifts were installed. Nurses spend a lot of time walking – usually to locate and gather supplies and equipment or to track down other staff members. One way to address this problem is to bring staff and supplies physically and visually closer to the patients. To take this idea further, new designs are incorporating decentralised nurses’ stations and alcoves outside patient rooms so that staff is distributed around the unit (as opposed to being in a single central location), closer to the patient. In the Clarian demonstration project described earlier, nursing stations with computer access and servers for supplies were decentralised. 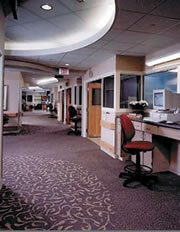 Further, additional workspace was provided outside each patient room. Also, to reduce time spent walking back and forth to the nursing station, necessary supplies were provided in each room. Hendrich and colleagues (2004) assert that the efficient unit design helped in reducing walking and supply trips, such that nursing time significantly increased allowing for a reduction in budgeted staffing care hours while at the same time increasing time spent in direct patient care activities. The evidence-based design elements described here as well as others are quickly becoming mainstream in the design of US hospitals. Clearly, they are as applicable and relevant to hospitals the world over. One reason for their adoption is the fact that these ideas are supported by a body of evidence. The idea that the initial upfront costs of construction can be recouped in the long run through savings from fewer falls, fewer nosocomial infections, fewer medical errors, fewer staff injuries, increased staff recruitment and retention, improved patient satisfaction and increased philanthropy makes a strong business case. For access to additional information and free whitepapers on several of these topics, please visit The Center for Health Design website at www.healthdesign.org or contact the author at ajoseph@healthdesign.org. 1. Ulrich, Roger S. 1984. View through a window may influence recovery from surgery. Science 224 (4647):420-421. 2. Ulrich, R. S., C. Zimring, A. Joseph, X. Quan, and R. Choudhary. 2004. The role of the physical environment in the hospital of the 21st century: A once-in-a-lifetime opportunity. Concord, CA: The Center for Health Design. 3. Hendrich, A., J. Fay, and A. Sorrells. 2004. 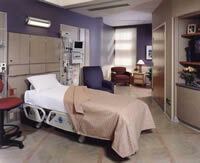 Effects of acuity-adaptable rooms on flow of patients and delivery of care. American Journal of Critical Care 13 (1):35-45. 4. Fragala, G. , and L. Bailey. 2003. Addressing occupational strains and sprains: musculoskeletal injuries in hospitals. AAOHN Journal 51 (6):252-259. 5. Joseph, Anjali, and Lola Fritz. 2006. Ceiling lifts reduce patient-handling injuries. Healthcare Design, March, 10-13.